Over 100 Robe moving lights were part of Tom Kenny’s lighting design for the 2014 Teen Choice Awards (TCA). The show, produced by Bob Bain, Greg Sils and Paul Flattery was staged at the Shrine Auditorium, adjacent to the University of Southern California campus in Los Angeles, California. Robe's moving lights around the Shrine auditoriumThe prominent event honored the best teen movies, music, fashion and (new this year), web stars, and attracted many rising young stars and celebrities. This year’s presenters included "Modern Family's" Sarah Hyland and "Teen Wolf's" Tyler Posey, and a staggering 164 million plus votes were cast by young fans through various social media channels. The show was broadcast live on the FOX Television Network. This is the fourth TCA that has been lit by Kenny and his team and again, this year, he worked closely with Set Designer Steve Bass and Video Designer Eli Kinney to make the show lively, action-packed and a bit edgy. Kenny used 60 x Robe Pointes, 24 x LEDWash 1200s and 12 x LEDWash 600s – all from Robe’s ROBIN series. He was also the first LD in the U.S. to use Robe’s new, bright moving light which will be launched worldwide in September. He used 49 of these special new fixtures in the rig. The Pointes were positioned on the stage floor and in the roof trusses, and used for a wide selection of looks and effects and as an integral element of the main ‘lighting picture’. Kenny is a big fan of the Pointe and, in fact, was also the first LD to use these fixtures in the U.S. last year. “The Pointes are bright and multi-purpose, and that’s the beauty of them. They can be used for anything and in all situations.” he commented. The Pointes had to hold their own against a large video-based set design and hundreds of other lighting fixtures, all supplied by VER, Los Angeles. The original Moorish revival art deco features of the auditorium – designed by G. Albert Lansburgh and dating back to 1926 when the current building was opened - were highlighted with Robe LEDWash 1200s, including the dramatic roof centrepiece complete with an ornate chandelier. LEDWash 600s were also used to wash up various pieces of drapery installed around the stage. Kenny worked alongside his regular Programmer Michael Appel who used a grandMA2 console, and Lighting Gaffer Bryan Klunder. One of the biggest challenges for the production team this year was the last minute venue change after Pauley Pavilion, the original location, was closed due to flooding. 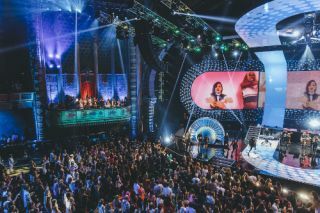 With a little over a week to go, the entire stage, set, lighting and video had to be re-designed to fit into the Shrine Auditorium, once home to the Academy Awards. However, despite this additional pressure, the show looked spectacular, and the technical production has been hailed as one of the best to date. Live performances by Demi Lovato, Cher Lloyd, Magic, Rixton, Becky G and Jason Derulo, plus a star-studded lineup of awards presenters and guest appearances all helped make it another memorable Teen Choice Awards.